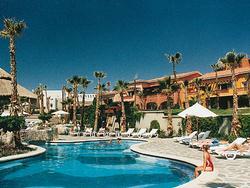 Situated in the heart of Los Cabos, the Sheraton Hacienda del Mar overlooks Tortuga Beach. Here on a private strip of golden sand, you can swim in the warm waters of the Sea of Cortez, surf, sail, or simply linger with a tropical drink in your hand and nothing on your agenda whatsoever. From the beautiful beach to five resort pools, steam rooms, sauna, the Cactus Spa, and the Sheraton Fitness Center, this Los Cabos timeshare offers so many ways to indulge your body and your senses. But in case you need more fun and entertainment, don’t forget the two championship golf courses at Golf by Cabo del Sol. With five accommodations options at the Sheraton Grand Los Cabos Hacienda del Mar, you can choose the timeshare ownership plan that fits your romantic getaway or the one that is just right for your lively group of ten. The Imperial Suite is designed to deliver ultimate luxury for a party of two, with 1408 square feet of space, a king bed, a living area with marble flooring, large windows overlooking two private terraces, a fully-equipped kitchen, and a spectacular ocean view. These elegant retreats also have dining for eight and the option to expand with connecting rooms, which makes them just as well suited for a working holiday as they are for a romantic escape for the two of you. Deluxe timeshares at Sheraton Hacienda del Mar offer 470 square feet of space, with a spacious sleeping area, an oversized bath with jetted tub, and either a garden or ocean view or direct ocean access. At 900 square feet, Parlor Suites provide a two-story experience with two bedrooms separated by a spiral staircase. Each unit has a bathroom with jetted tub, ocean views, and a private balcony. One-bedroom timeshare units at this Cabo San Lucas resort accommodate up to four vacationers and include a fully equipped kitchen, a living and dining area, and an incredible ocean vista. The largest accommodations at the Sheraton Grand Los Cabos Hacienda del Mar are the 1625 square feet of the Virreyes Suite. With either three or four private bedrooms, two terraces, a kitchen, and a living and dining area, these ocean-view retreats offer space and amenities for up to ten vacationers. Contact Sheraton Hacienda Del Mar Resort Specialist Today! Days: Saturday, Monday / Time: 4:00 P.M.
You have all the amenities of the large Sheraton Resort. 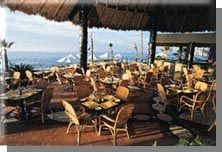 The water is so clear that you can see the bottom up to 50 ft..3 restaurants - the best is a 5 star diamond award Pitahayas serving great food with good variety, all fresh including Spanish and fish dishes by the famous chef Volker Romeike. A spas is on sight, with all water sports, sun bathing and a cascading water fall in the special pool. They have 2 championship golf courses near the resort to challenge you, so check those at as well.